We will post a list of events for 2018 soon. Professor Stephanie Watson, head of the Australian Keratoconus Registry and Fight Corneal Blindness projects will present an update on the Crosslinking Registry launched in November 2015. Some 80 people with keratoconus, their families and eye professionals attended the launch of the Keratoconus Club in Sydney on October 6, 2016. 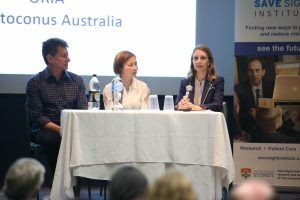 A joint initiative of Keratoconus Australia and the Save Sight Institute, the Keratoconus Club will be an informal meeting place for people with keratoconus and their families in the Sydney area. It will provide a forum for learning more about keratoconus from the professionals, exchanging stories and experiences about living with keratoconus and discussion around the issues that interest you. At the October 6 launch, Clinical Professor Stephanie Watson, a corneal specialist and head of the Fight Corneal Blindness module of Save Sight Registries, discussed keratoconus, various treatment options currently available and research developments. Ms Michelle Urquhart hosted the session and will act as the contact point for NSW patients interested in receiving support and becoming involved in the Keratoconus Club. Dr Elsie Chan, researcher at the Centre for Eye Research Australia (CERA) presented an update on the latest results from the world's longest running randomized trial of crosslinking which was conducted at CERA. Dr Chan reviewed developments in crosslinking around the world, where a range of protocols are now being adopted to ameliorate the outcomes of crosslinking for patients while minimising side effects and discomfort. These include the epithelium-on method, accelerated crosslinking and repeat crosslinking. Finally Dr Chan discussed the Crosslinking Registry being developed at Sydney's Save Sight Institute in collaboration with CERA and with the support of Keratoconus Australia. This will be a critical tool in the evaluation of crosslinking in Australia, and benchmarking of patient outcomes. Over the past decade, corneal collagen cross-linking has become commonplace as a treatment option for people diagnosed with progressive keratoconus. Results have shown that cross-linking slows and may even halt the progression of keratoconus, with a small risk of complications. More recently, variations to the cross-linking procedure have been performed. 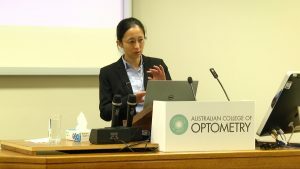 In her talk, Dr Elsie Chan, researcher at the Centre for Eye Research Australia, reviewed the theory, different treatment regimes and the clinical results of cross-linking. She also presented an update of the results from the Melbourne trial and other upcoming research projects. Eye rubbing has been identified as a high risk factor in keratoconus and should be avoided as much as possible. However as many keratoconus patients also suffer from allergies which can cause severely itchy eyes, it is important that they ensure proper management of these allergies to prevent worsening their keratoconus and to facilitate contact lens wearing. Current research also shows an increase in the prevalence of all types of allergic responses in the eye and dry eye continues to be a major impediment to contact lens wear. Recent advances in diagnosis and treatment can significantly improve management outcomes and early diagnosis and treatment of the signs and symptoms can help patients more comfortably wear their lenses. In this presentation A/Prof Roth reviewed the latest thinking on allergy and dry eye diagnosis, giving particular attention to the latest treatment options and how they are best used. Despite the recent focus on new surgical treatments, contact lenses remain the mainstay for people seeking a long term solution for vision loss caused by keratoconus. Contact lenses, notably rigid gas permeable lenses (RGPs), have evolved considerably over the past decade and can assist a far wider range of patients with keratoconus than ever before. In his presentation, Professor Jackson explained what keratoconus is and the challenge it poses for both optometrist and patient. He reviewed the symptoms and signs associated with the condition and discussed the relative importance of a range of techniques used to both detect and quantify the severity of the condition. Professor Jackson also examined the merits of providing various types of optical correction including both spectacles and contact lenses and the need for proper aftercare. Finally, he discussed his experience in Northern Ireland working with a variety of keratoconus patients. Living with keratoconus is not always easy. Although glasses and contact lenses can improve vision, studying and working for long periods on computers and in difficult environments can be challenging. Working and studying after a corneal transplant can be even more complicated. Heidi Littleford, an educator for sight-impaired students and KA committee member, discussed her experience as a bilateral corneal transplant recipient and some of the issues which face students with keratoconus and their parents, along with strategies for dealing with them. Professor Coster examined different aspects of keratoconus including current and future research, corneal collagen crosslinking and other new treatments. He also discussed evidence-based medicine and how patients can assess the suitability of these treatments and when to have them. 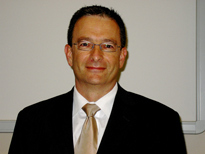 Prof Doug Coster is an internationally-recognized expert in keratoconus research and treatments with over 35 years experience in Australia and overseas. 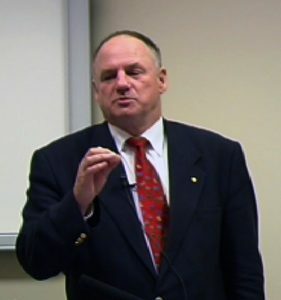 He currently holds a range of distinguished positions including Lions Professor of Ophthalmology at Flinders University (SA), Senior Director of Ophthalmology, Flinders Medical Centre, is editorial board member of several international ophthalmology publications and serves on a number of government advisory committees.